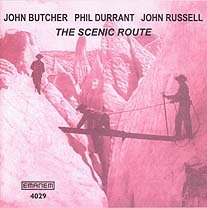 John Butcher, soprano and tenor saxophones; Phil Durrant, violin; John Russell, guitar. Tracks 1-4 recorded on 22 May 1998 at Musique Action '98, Vandoeuvre-les-Nancy, France; track 5 recorded on 15 March 1998 at the Red Rose Club, London. Illustration (reproduced on cover above) taken from a black and white photo of Glacier des Bossons, Mont Blanc, c.1890.